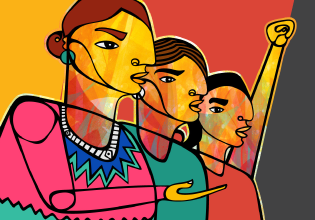 January 2018 marks a critical moment and as we look back on the past year since the U.S. Inauguration and the historic Women’s Marches around the world, we’ve seen the power of women and the power of cross-movement organizing. We’ve seen the incredible creativity of unapologetic advocates for justice working for a better world for all. Now, we are more focused, driven, and excited than ever to make the biggest difference for women and girls in the year ahead. How? Here is our roadmap for women’s rights in 2018. November 17, 2016: November’s U.S. Presidential election outcome was not the glass ceiling-shattering moment many hoped it would be. But as I sat in our meeting of Global Fund for Women’s Board of Directors on November 9th, the day after Election Day, surrounded by women activists and leaders from the U.S. and around the world, I felt a new sense of hope. As we discussed the implications for women’s rights domestically and globally, I felt a renewed sense of determination. Today, I feel more strongly than ever that this is our time. Now is the time that women and girls here in the U.S. and around the world must stand together and take action. Now is our time to get loud and fight for what we believe in, to stand in solidarity with one another, and to build a better, more equitable future. Now is our time to fiercely defend and advance human rights around the world. In Brazil, women are leading the charge to boldly push back against interim President Michel Temer’s anti-women, anti-Black policies and actions. In Poland, women’s groups fought back when the government proposed a strict abortion ban, bringing thousands of women and men to the streets—and won last month, though the battle is far from over. In Turkey, women’s groups are demanding an end to the crackdown on journalists and academics who are speaking out against human rights violations. In northern Nigeria, women have been leading the movement to “Bring Back Our Girls” and holding the government accountable in the fight against Boko Haram, which helped to drive the recent safe return of 21 girls who were kidnapped from their school two years ago. In Egypt, women are continuing to provide safe spaces for survivors of violence despite repeated attempts by the government to close their doors. Women’s movements all around the world are facing threats to their fundamental rights, ranging from abortion access and ending sexual violence to racial justice and environmental rights. And they are fearlessly fighting back. Women and girls in the U.S. and around the world must stand up, rise up, and get loud together. Now is our time. We’re seeing what President-elect Trump could really mean for America and what his election could mean for human rights globally. Since the election, there has been a disturbing uptick in harassment and hateful intimidation against people that Trump targeted with his campaign rhetoric—immigrants, Latinx, people of color, Muslim and Jewish Americans, LGBTQI individuals, and women. Trump has made clear that he will directly target women’s reproductive rights and access to safe and legal abortions, saying he is focused on nominating a U.S. Supreme Court Justice who is against a woman’s right to choose. And his commitment to denying climate change, calling it a “hoax” and suggesting several times throughout his campaign that he will remove the U.S. from the Paris Climate Accord, is damaging for people around the world—and for generations to come. Rather than allow Trump to build walls of any kind, literal or figurative, let’s work harder than ever to break them down. Let’s ensure that our work to see the commitments we share across issue areas prevails, that women, girls, men, boys, and LGBTQI individuals work together, and that human rights for everyone are not only defended but strengthened. To everyone in the U.S. and around the world: let’s commit to getting together and making our voices heard. Let’s rise up against sexism, racism, homophobia, xenophobia, and hate. Let’s stand with one another and with those around the world who are fighting harder than ever not only for our rights but for those of our sisters and neighbors who are targeted—people of color, Muslim, LGBTQI, or living with disabilities. Let’s work together to build women’s movements that are thriving, unified, and fearless. Let’s show the world that it will be a better place for everyone when every woman and girl is strong, safe, powerful, and heard. No exceptions. We have our work cut out for us, and we don’t have any time to waste. Commit to #BuildMovementsNotWalls for women’s human rights. Donate to advance women’s rights around the world, sign up to be a champion for equality, share this message on social media, or explore other ways to take action. Let’s stand together. Now is our time.